Hello! I did not mean to take such a long blog break- but a new baby will do that to you. However, he is doing much better- thank you for your sweet comments! I have a great Deseret Book CD give-a-way- this week- so make sure to check that out later. Here are some of the things we did for our Lego Party - credits and links I used to come up with this some of this, will be linked at the bottom of the photo they are found in. We found lots of great decorating ideas online. I sewed up some streamers- as seen here, bought a diposable tablecloth at the dollar store, and blew up some matchy balloons. I also cut out construction paper Lego pieces - using the printable found here. Instead of making huge birthday banners, I have decided to make a b'day poster- printing it up at Costco- and making it small enough to fit in a scrapbook album- so we can save them from year to year. 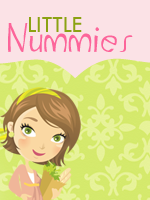 I used a cute printable made by Delia Creates-which I also used to make party invites. Zakka Life provided this free Lego guy- which we used to let each child design their own Lego guy. This is what I had them do when they arrived. To keep it simple, we just used crayons, and the face was already drawn on the Lego guy cut outs. The kids were so creative with this, and really loved it! Here are some of the finished Lego guys. They wrote their name on them, and then as they got prizes, or other things to take home, they placed it on top of their Lego guy. Guessing or Estimating how many Legos were in the jar was a fun one- but with 6 year olds, you have to give them a range of numbers to choose from. I told them there was more than 50 and less than 150 - to help them with the guessing. There was a small prize for the person who guessed the closest. We used these Legos later for another game. This was one of my favorite things to do- build a car- idea found here. To do this, I had to purchase a large quanitity of wheels, etc. and sort them all beforehand. 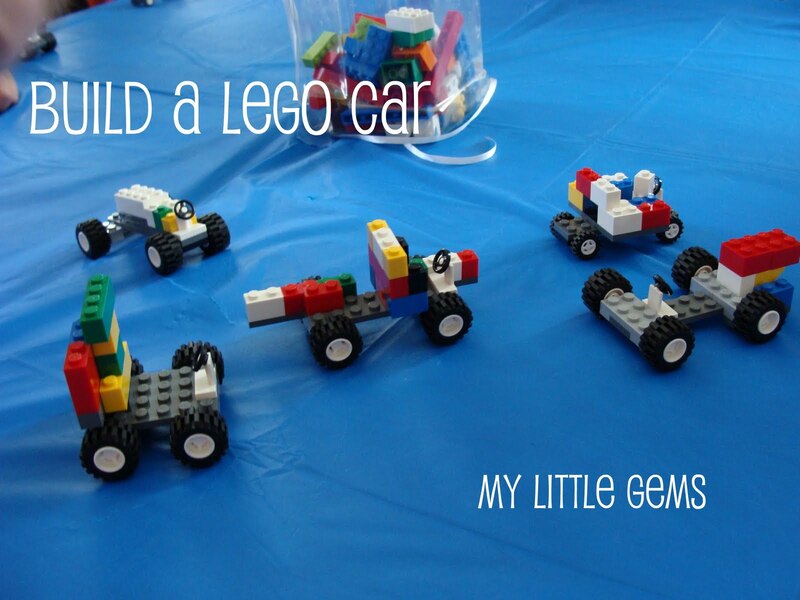 We gave each child the same number of pieces and let them build a car. Next, we raced the cars-using the table as seen below. 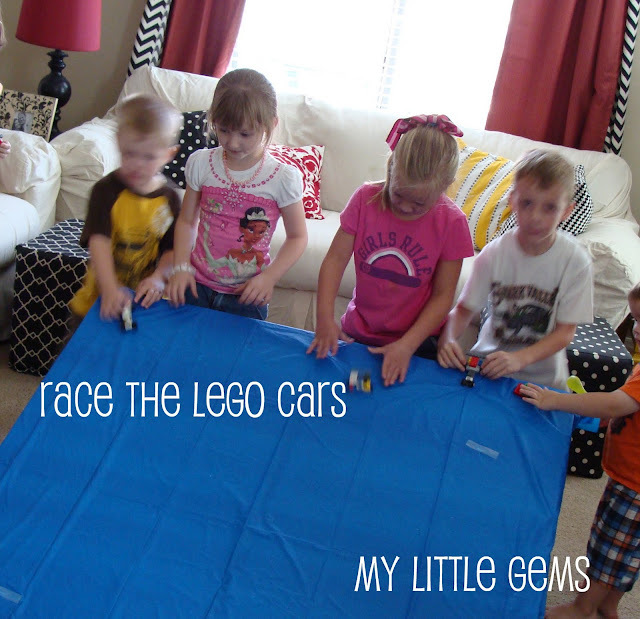 It was fun to watch them race their cars- some just fell over because they had so many Legos on them- and some actually went very fast! So this was also learning activity for all of the kids. What child doesn't love I SPY games? 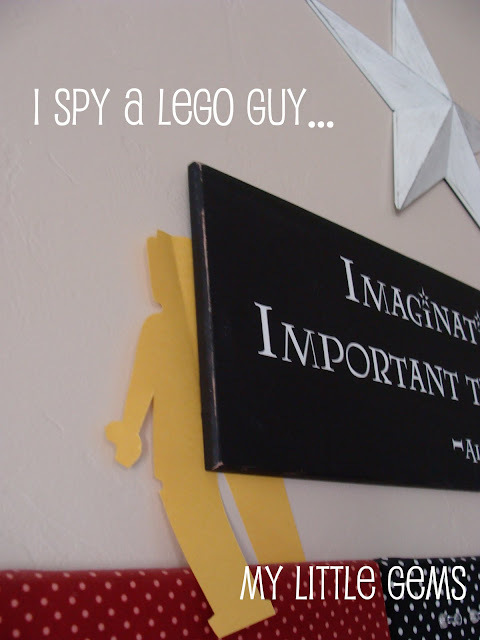 We hid several Lego guys around the house- in plain sight- and had them look around to find them-"I SPY a LEGO Guy". We play this with every b'day party- whatever the theme is- we will play "I SPY" with it! This is a game you could play several ways. 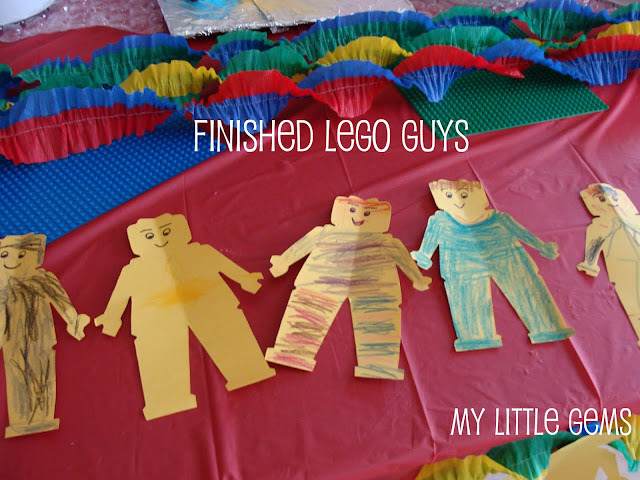 We used a big flat Lego piece and passed it around the table. 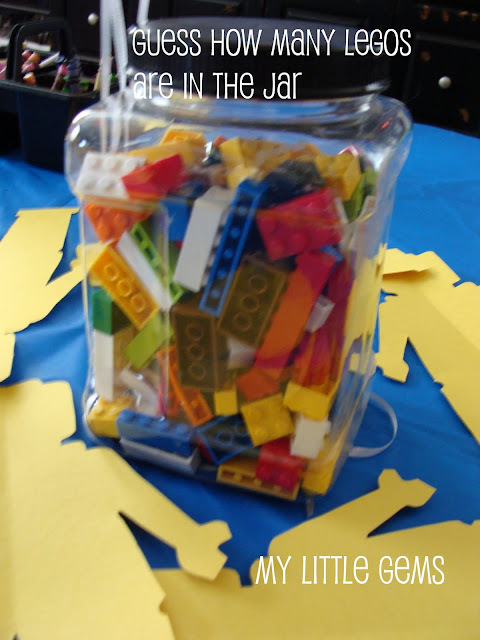 I had a brown bag, and the kids drew Legos out of the bag and added it to the Lego sculpture. I told them a number to draw each time. I was going to wrap up all the Legos and have them unwrap them, but I ran out of time for that. You could also use a dice, and have them roll a number and draw that number of Legos to add to the sculpture. We called it "Lego Collaboration". There was no winner- it was just fun to see what they could build with the Legos when working together. If the kids were older, you could have two groups and have them race. I purchased a box of Lego guys, and some Lego candy online. I put them in little baggies with some other little candies. 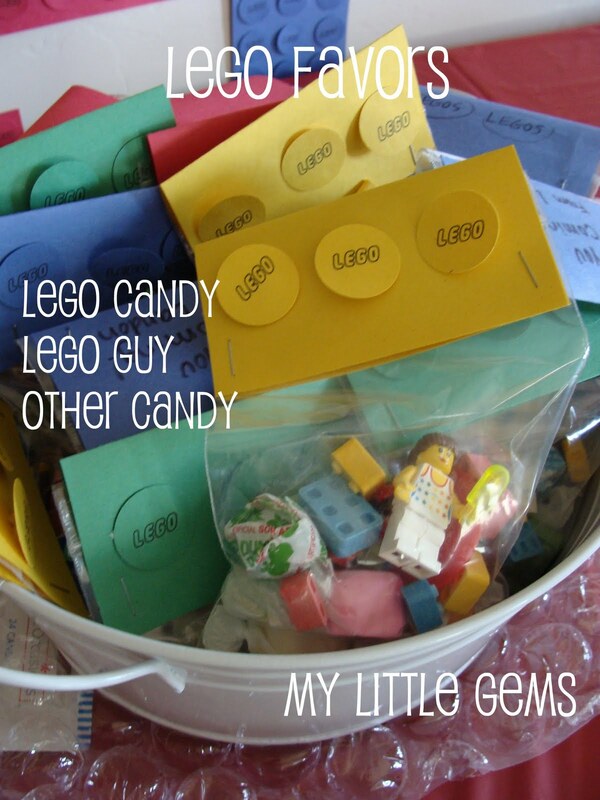 The Lego candy is not that great tasting- but the kids absolutely loved it! You can build with it too. 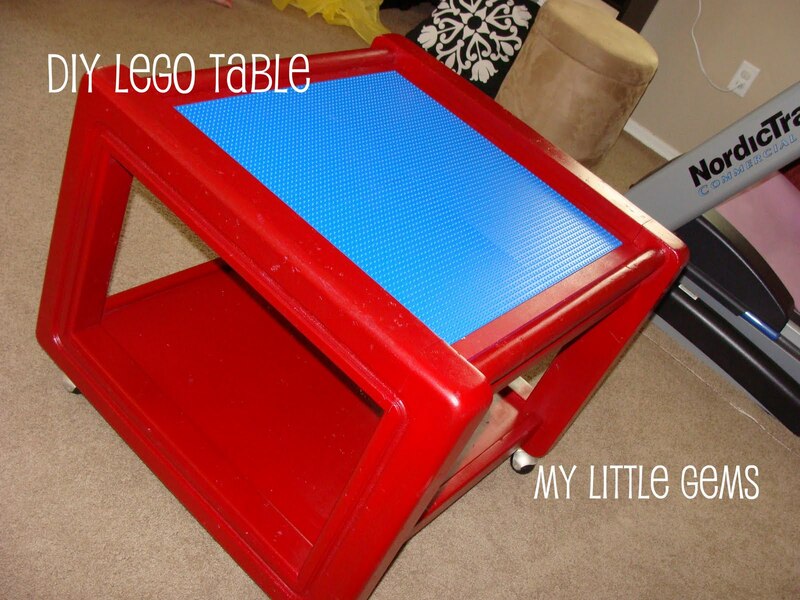 Our big present was the Lego Table we made from a Coffee/End Table. The kids that were waiting for their rides, played with this while waiting. Overall it was a fun successful party. 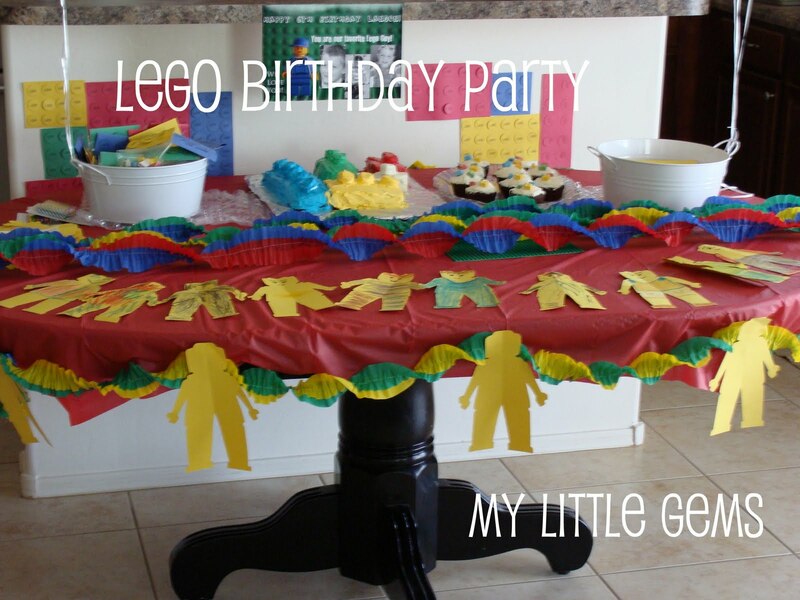 I am sure there will be another Lego party in this house someday....with four boys around~! Thanks for keeping it real! Love the Costco photo poster idea. Awesome- now the scrapbook page is done! What a great party! Thanks for linking to me. 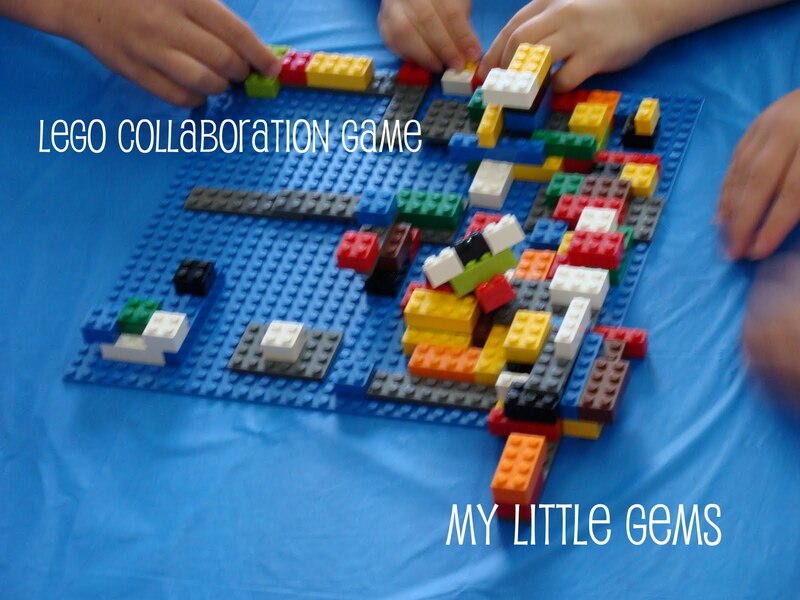 I really like that you used the collaboration game. You're the first that I know of that used that one. I like that it is non-competitive and just silly. 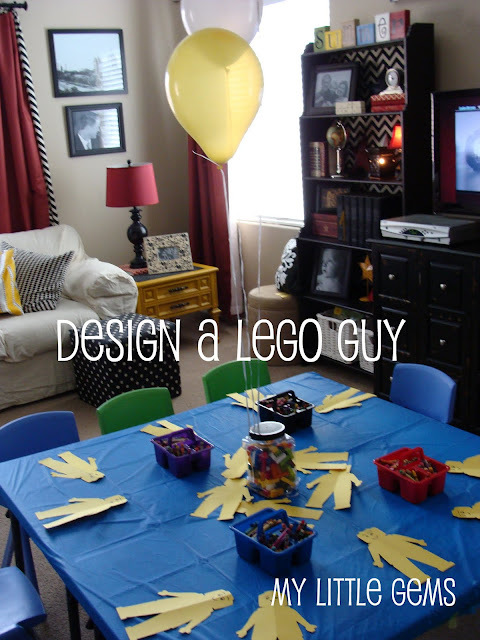 Thanks for the great Lego party ideas. How did you play I spy the Lego guy? I want to do this at my son's bday party, but am unsure how to play. Thanks! To play "I spy a Lego" or "lego guy" just hide some around the room- we used paper lego guys- but you could use legos- and let the kids go around and find them... there isn't really much to it- but they really love it. 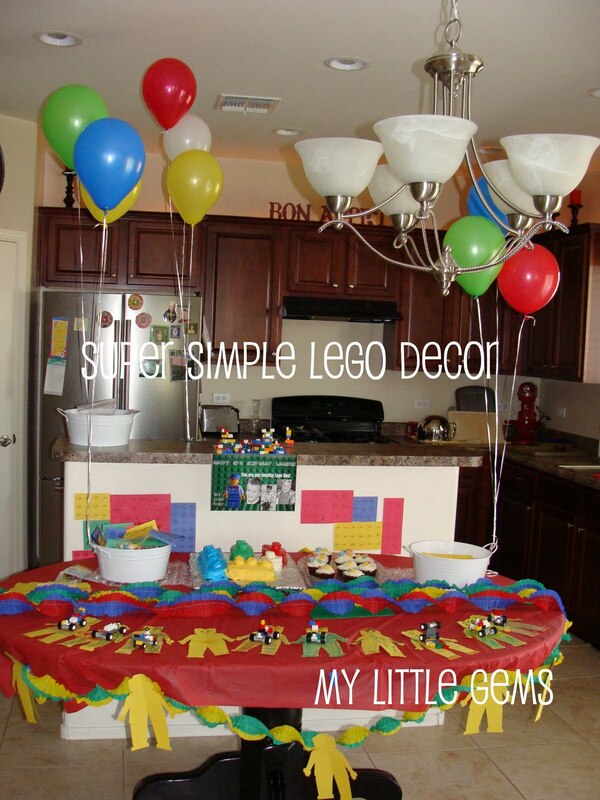 great idea.. lego party is one of my favorite.. you really did a great job here..
Looks awesome! Where did you buy the bag of Lego guys?